Today’s “Pioneers of the Sport” features the first BJJ black belt in the Land of the Rising Sun, Yuki Nakai. 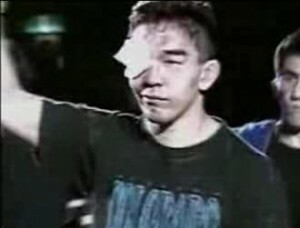 As many of you may know, Nakai fought Rickson Gracie in the Vale Tudo Japan tournament in 1995 with only one healthy eye. It is a misconception that after his fight with Rickson, Nakai decided to learn BJJ. The truth is that Royler Gracie was the one who inspired this Japanese warrior to learn BJJ. 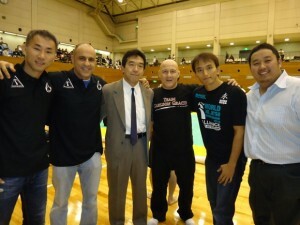 After their encounter, Yuki Nakai went on to receive his Black Belt from Carlos Gracie Jr. and opened the leading BJJ academy in all of Japan, Paraestra (named after an ancient Greek wrestling school). Nakai students include Yukinori Sasa, Kazuya Satoh, Yusuke Honma, Yoshihiko Matsumoto, Arabe Kenji and Shinya Aoki. Below is an interview from Metropolis Magazine. Yuki Nakai expected Gerard Gordeau to fight dirty. What he didn’t expect on that fateful night 15 years ago was to be gouged in the right eye so badly that he’d lose his sight. The Vale Tudo Japan Open 1995 at Nippon Budokan propelled Nakai to the status of legend in many Japanese mixed martial arts (MMA) circles. Since then, he’s continued to give back to the sport, becoming one of Japan’s most influential fighting figures in the process. Oh yeah, and somewhere along the way he might’ve also helped save MMA. Despite suffering a severe injury at the hands of Gordeau—he’ll never see out of his right eye again—Nakai still harbors a deep love for the sport. So much so, he’s made it his mission to spread the positives of fighting at his gym, Paraestra Tokyo, where he spends six to seven hours a day training fighters and non-fighters alike. Paraestra is a gym only in the sense that people train there. It’s not a sprawling complex, nor is it filled with state-of-the-art equipment. Instead, the facility is an exercise in simplicity; its location in the basement of a building in Nerima-ku is far from the glitz, glamour and distractions of the current MMA landscape. The floor is a soft, thick, turquoise mat used for breaking falls, and padding runs along the bottom half of the concrete walls. Just above eye level hangs a row of fighters’ gloves, while a few posters and a calendar serve as makeshift decorations. Nakai founded his Spartan gym in December 1997, and uses it as a base to promote the positive elements of a sport whose violent tendencies more often than not get the best of it. It’s just before his first class of the day, and Nakai is sitting cross-legged on the floor. Behind him is a shelf with a row of belts draped across the front. They come in a variety of colors—white, blue, yellow, brown and, of course, black—hanging in silent confirmation of their owner’s skill. Nakai was born in 1970, in Hamamasu village in Hokkaido. He went to high school in nearby Sapporo and attended Hokkaido University, where he was a member of the judo club. After moving to Yokohama in 1992, he first made a name for himself in Shooto, a more physical and realistic form of pro wrestling, where he trained under Satoru Sayama, better known as the original Tiger Mask. Nakai later became one of the Japanese pioneers of Brazilian jiu-jitsu, after learning it at the feet of some Brazilian masters. His accomplishments have garnered him the admiration of countless fighters both in Japan and overseas. Nakai has trained a number of current fighters, including Japan’s top MMA star, Shinya Aoki, aka the Tobikan Judan—roughly, “Master of Flying Submissions.” Aoki is the current DREAM lightweight champion and is expected to headline the upcoming MMA event on Sept 25 in Nagoya. Ironically, teacher and pupil share a common bond in that their legacies have been shaped by two of the most infamous incidents in Japanese MMA history. During his match against Mizuto Hirota at the PRIDE Dynamite!! event last New Year’s Eve, Aoki applied a hammerlock, which involves grabbing the opponent’s arm and pressing it against his back. Against a fighter of Aoki’s caliber, escape was impossible, yet Hirota refused to signal defeat by tapping the mat. So Aoki simply locked in the hold until Hirota’s arm broke, twisting at a sickening angle. His opponent vanquished, Aoki leapt up, bent over and laughed in Hirota’s face, flipping him off for good measure. Condemnation came swiftly from across the globe, forcing Nakai to post an apology on the Paraestra website and fire Aoki as an instructor at the gym. Yet even though he condemns Aoki’s post-fight actions, Nakai still has tremendous respect for his pupil, whose controversial antics in and out of the ring have earned both scorn and praise. The outrage over the incident stemmed solely from Aoki’s boorish behavior after the bell: the breaking of the arm, however brutal, was mostly seen as a part of the sport, and a consequence of Hirota’s failure to surrender. Things were different during Nakai’s heyday in the ’90s, when that type of injury may have set off a firestorm of criticism. Back then, MMA still faced opposition from many areas and was fighting to gain more mainstream acceptance. So even though he had been blinded by Gordeau, Nakai kept quiet, a move that most likely saved the sport from calls for a ban. So Nakai fought on and—unbelievably—defeated Gordeau and then Craig Pittman that same night to advance to the final. There, he was defeated by Rickson Gracie, a member of the famed Gracie fighting family—and one of the most skilled Brazilian jiu-jitsu practitioners in the world. The fortitude that Nakai demonstrated during the tournament earned him a tremendous amount of respect. After his loss to Gracie, Nakai concealed the full extent of his injury for nearly two years. His semi-blindness eventually forced his retirement from MMA, but it also led to his other contribution to Japanese fighting: after watching a fellow Japanese competitor lose to Royler Gracie, Rickson’s younger brother and a skilled practitioner of Brazilian jiu-jitsu, Nakai was inspired to change his specialty to the Brazilian martial art. “That was when I started to think that, although I wouldn’t be able to return to MMA, if I was able to become successful in jiu-jitsu, it would eventually lead to an improvement in the level of Japanese fighting,” he says. Jiu-jitsu’s focus on grappling and ground fighting is one way for a smaller fighter to defeat someone much larger. Nakai learned the style and began teaching it to Japanese fighters. “Since I was originally from judo, it was relatively easy for me to learn Brazilian jiu-jitsu techniques,” he says. “At the same time, I learned techniques I wouldn’t have otherwise learned in judo from great Brazilian jiu-jitsu masters. I was able to broaden my horizons by learning it, and it has led to the development of the sport.” Nakai ended up receiving a black belt in the art. Although Nakai has been out of MMA competition for some time, he still follows the sport. DREAM 16 sees Japanese MMA at a crossroads. It’s hoped that the recent tie-up between the organization’s parent company, Fighting and Entertainment Group, and PUJI, a Shanghai-based investment bank, will help it to expand internationally. Nakai continues to do his part away from the spotlight, and is committed to seeing Japanese fighters improve their stature worldwide. very worthwhile points you have noted , thankyou for posting .